Our topic is Home Culture. We engaged with the celebration of the New Year's Eve. Are there any differences? When do people celebrate it? What do they do? 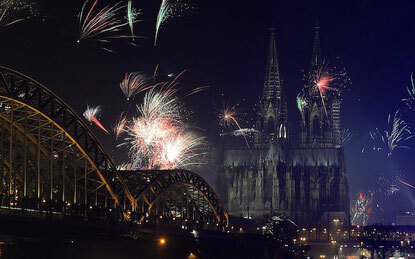 Most Germans look forward to celebrating New Year’s Eve because it’s the beginning of a year. New Year’s Eve is celebrated on the 31st of December to 1st January. The celebration starts in the evening and most people spend this day with their families. In the evening, they go to a restaurant or eat at home. One popular dish is raclette. You have a little pan in which you can roast different kinds of food, for example, potatoes with ham or cheese and vegetables. After that, a lot of families watch a traditional TV show called “Dinner for One” or play some games together. Some teenagers go to a bar or a party with their friends, they dance, sing, eat and drink together or play games. At twelve o’ clock, everybody lights their fireworks and wishes each other "Happy New Year". The fireworks are very colourful and noisy but they are also very beautiful to see. Some people spend more than one hundred euros on them. Imagine that you are German and your friend (a Syrian refugee) wants to know how you celebrate the beginning of the New Year. How long does the celebration take, when do you celebrate it, what do you eat ... ?